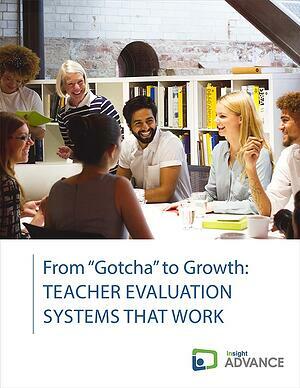 The field of public education has made a big bet when it comes to teacher evaluation. But has that paid off? In some regards, it has. Over the past few years, 45 states have revised their educator evaluation practices to include more frequent observations; better frameworks and rubrics to assess instructional practice; more intensive training for evaluators; and of course, the inclusion of student achievement measures. Although this is progress, some might argue we’re still losing the big bet. If evaluation is intended to improve teaching practice, then something isn’t working. In all but a few of these 45 states, no real progress has been made in moving the needle – in either quality of instruction or student achievement. highlight workable strategies help you build a growth-based evaluation system.